New Ultimate Sitting Attachment for hoverboards - HoverSeat Deluxe™. 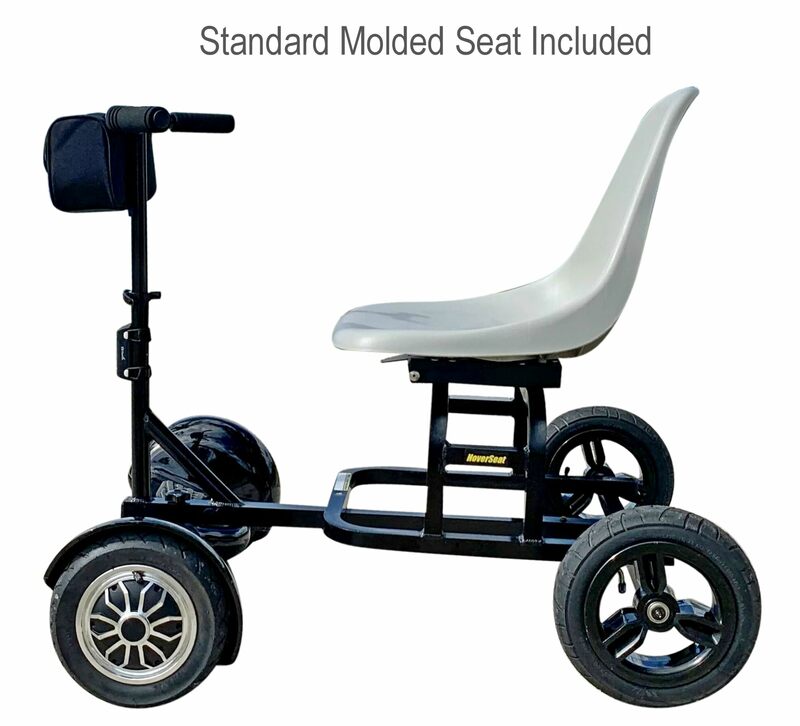 New hoverboard sitting attachment now comes with a handle bar and molded seat! Next step in HoverSeat family of hands free scooters is HoverSeat Deluxe. 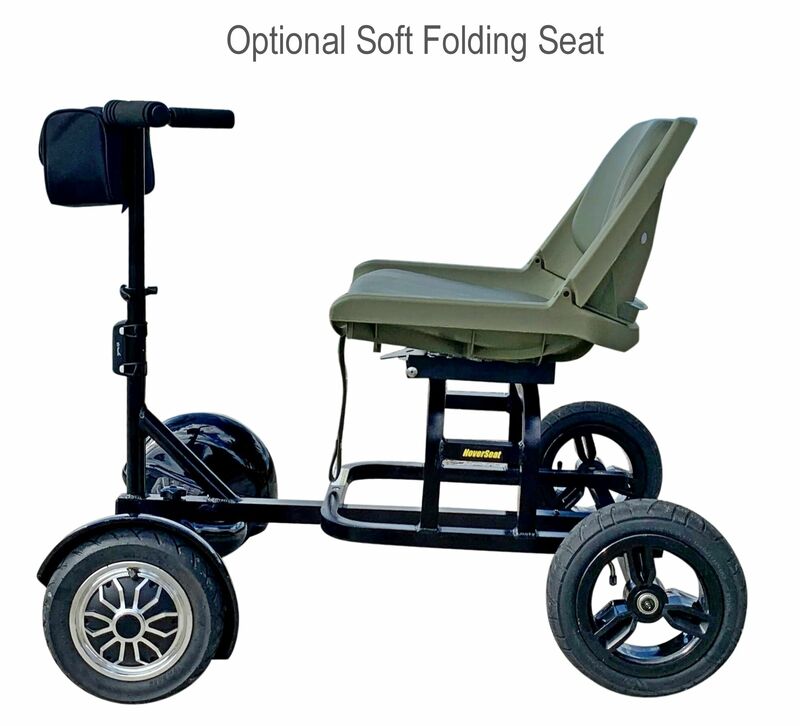 Not only it comes with comfortable plastic molded chair, but it also have a handle bar add-on that allows extra support and safety for rider. Handle bar add-on purpose is to hold on to it, or lean on it. It is not designed for steering. HoverSeat is a hand free mobility solution, and therefore steering done by feet only, which is very easy and intuitive. 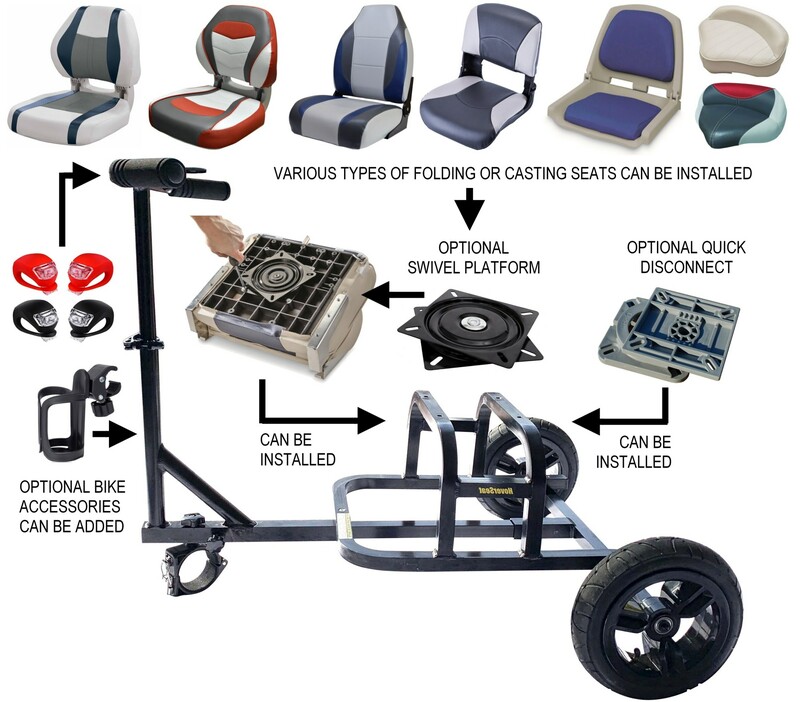 What makes HoverSeat Deluxe unique, is an ability to replace provided molded seat with other type of optional seats of your choice. 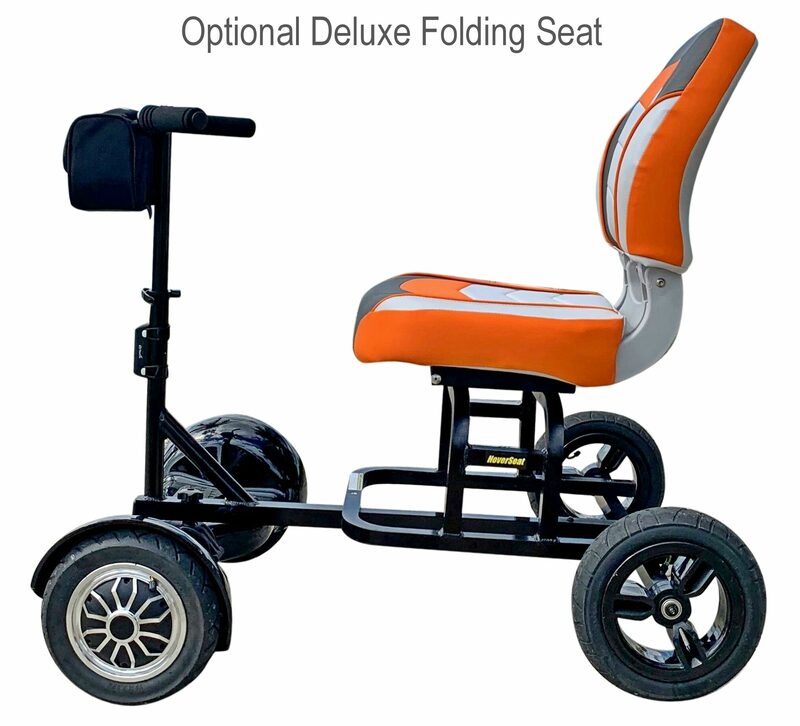 Most type of folding seats or even bike type casting seat can be installed on top of HoverSeat Deluxe frame. HoverSeat Deluxe has 4 holes that matches standard position of holes on most boat folding seats of fishing casting seats. With fishing casting seat installed, HoverSeat looks like a 4-wheels bicycle. 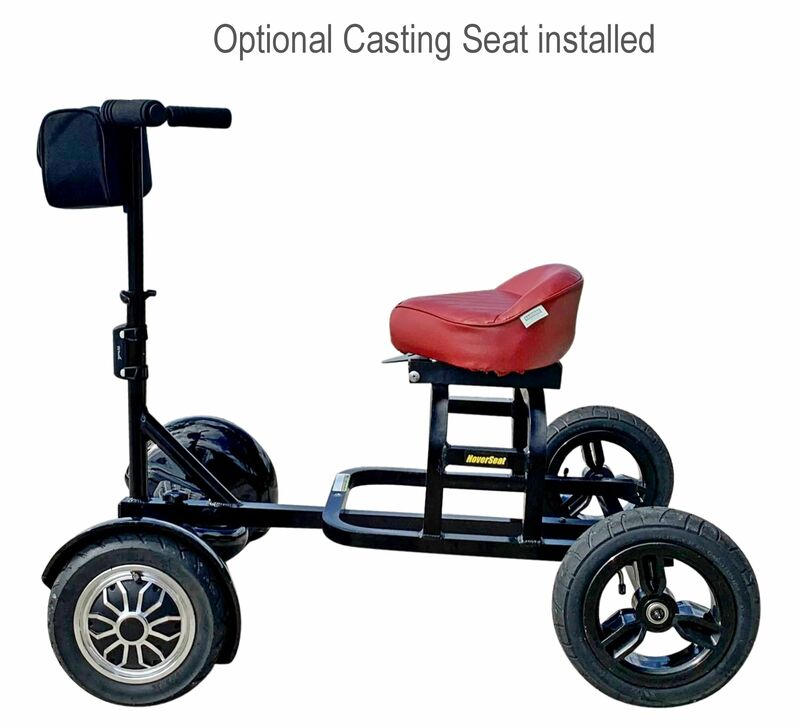 In addition, swivel platform and/or quick disconnect can be mounted on top of frame, to allow rotation of seat and/or its quick removal of seat with quick disconnect optional add-on. Swivel platform can also work as an adaptor between existing holes on top of frame and any type of folding seat available on a market, in case if holes does not match exactly, as some minor variations are possible. HoverSeat Deluxe with handle bar add-on installed can be outfitted with various bicycle auto market accessories available anywhere. Bottle holder, bike bell, front light, rear light, cell phone holders and bike bags can be mounted all over handle bar and HoverSeat frame. Handle bar post has a quick release that allow easy removal of handle bar fro portable storage into smaller cars. Optional quick dicsonnect allows easy removal of seat for portable storage. 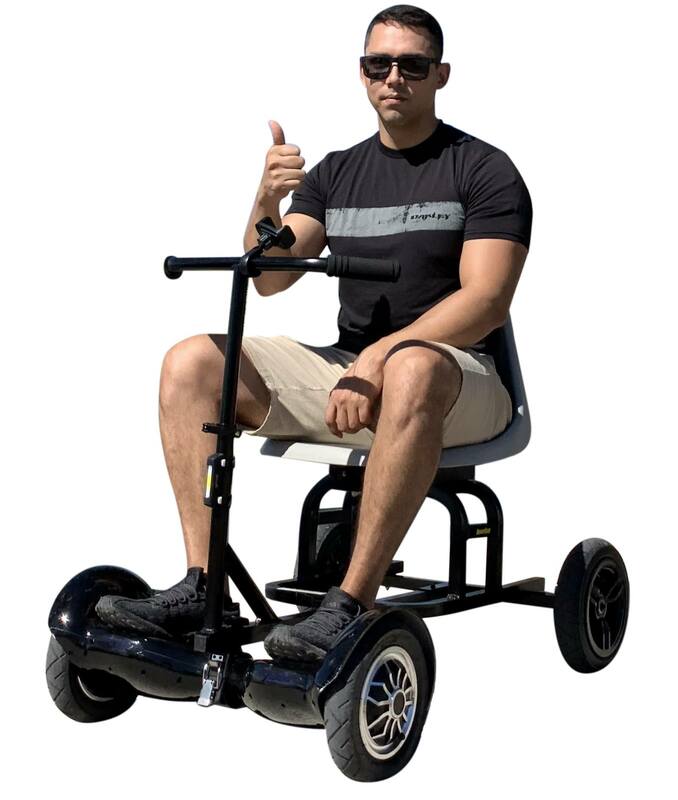 If battery of hoverboard run low while you are on a road, then hoverboard can be loaded on top of seat, and carried forward to charge stations, using HoverSeat as a push cart. Wheeled cargo, such as hand carts, utility carts, shopping carts, etc can be attached behind HoverSeat Deluxe to pull behind. 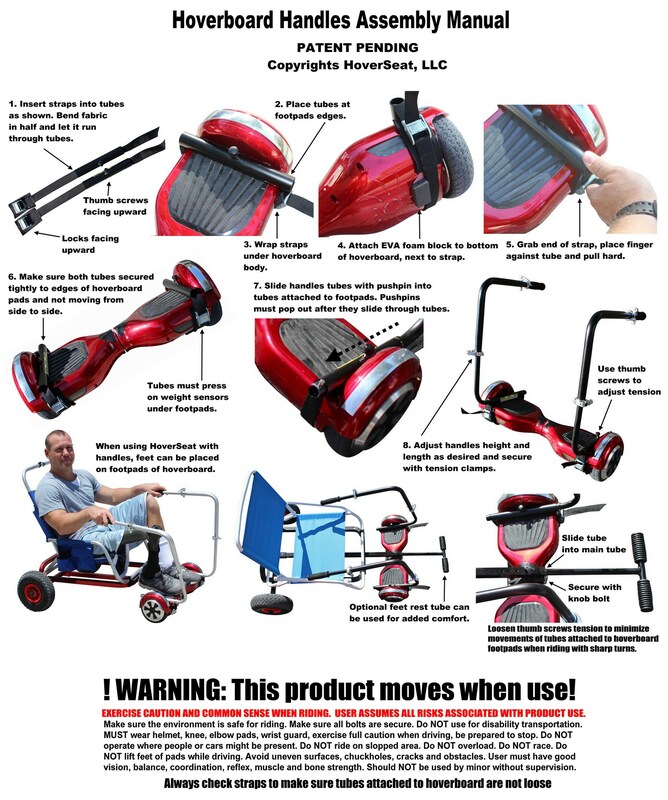 Click on ATTACHMENTS tab to download HoverSeat Deluxe Manual and Assembly Instructions. What is included with a HoverSeat Deluxe? Light Gray plastic molded seat. Plastic clamp for round center hoverboards incldued. Assembly required. Please refer to above Assembly instructions. Where to get hoverboard for HoverSeat Deluxe? For best performance and riding pleasure we recommend 10" pneumatic wheels hoverboard. It provides softer rider over pavement and better off-road capability. You can purchase inexpensive 10" hoverboard on Ebay, Amazon, or just search Google for 10" hoverboard. Please note that hoverboard must have round middle to work with our clamp. HoverSeat XL clamp works ONLY with these 2 types of hoverboards with ROUND middle. Will NOT work with Swagtron T2, T3. WARNING: EXERCISE CAUTION AND COMMON SENSE WHEN RIDING. The user of this product assumes all risks associated with its use. Rider assumes all risks associated with activity. Make sure the environment is safe for riding. Make sure all bolts are secure. Inspect clamp for cracks or damages. Use all necessary body protectors. MUST wear helmet, knee, elbow pads, wrist guard, exercise full caution when driving, be prepared to stop. Do NOT operate where people or cars might be present. Do NOT ride on slopped areas. Do NOT overload. Do NOT race. Do NOT lift feet of pads while driving. HoverSeat is not disability vehicle transportation. This product should not be used by persons without excellent vision, balance, coordination, reflex, muscle and bone strength or good decision making capability. This product should not be used by minor without adult supervision. This product should not be used by persons unwilling or unable to take responsibility for their own action. To minimize assumed risks, the user must wear helmet, elbow and keen pads and appropriate shoes. Do not operate this product in traffic, wet, froze, oily or unpaved surfaces. Avoid uneven surfaces, chuckholes, cracks and obstacles. Q. What is the warranty for HoverSeats? A. The Manufacturer Warranty for the HoverSeat aluminum frame, wheels and clamp is one year from the date of product delivery. Please keep all sales receipts to claim the warranty. No warranty will be covered without a sales receipt. The warranty does NOT cover scratches, discolorations, rubber layers delamination, tie downs, plastic T-handle or accidental damages due to product use. We will repair or replace defective parts at our discretion. Customers are responsible for all shipping charges associated with warranty services. The defective item must be delivered back to us for inspection, repairs or replacement. To initiate a customer request, please email us a picture showing the nature of the damage, an overall picture of the product and the order number or name on the order. Q. What is return policy for HoverSeat ? A. You have 30 days from date of delivery to return HoverSeat product back for a refund. We suggest watching instructional video to make sure you are properly using HoverSeat with a hoverboard. Please keep all receipts, boxes and packing materials. While we understand that product can't be returned in a brand new condition, it is however customer's responsibility to clean up all signs of use that can be removed, such as: wipe clean all dirt and dust, wash wheels, remove any type of dirt, grime and dust from all components. If we have to clean product after return, then we will have to charge re-stocking fees. Please pack everything exactly same way as you received it, and send back to address on a shipping label, only after receiving RMA number from us via email. Refund will be issued via company check for product price, less shipping charges. Shipping charges are NOT refundable. Please email 2 weeks after return for refund status update. Q. What is included with the HoverSeat? A. The HoverSeat XL product includes: aluminum frame that requires simple assembly, two pneumatic wheels, plastic clamp that secures to the middle of the hoverboard, and a product manual. Also included as a free bonus is one plastic T-handle that can be installed in order to provide an additional option for pulling a cart by hand, if needed. Q. What hoverboard do you recommend for HoverSeat? A. If you don't have yet a hoverboard, and thinking about buying one to use with HoverSeat, then we suggest getting 10" hoverboard with pneumatic wheels. Its feel very nice to ride, can be used off-road, and provide most comfortable ride. Small 6" hoverboard with non-pneumatic rubber wheels feels too bumpy and hard on a regular urban pavement that is covered with cracks and joints. Hoverboards with 6" wheels can be used on a smooth asphalt or concrete surface, but become rough on a pavement with multiple cracks, blocks and bricks type of pavements. HoverSeat clamps will not work with 8" wheels hoverboards, because they don't have round middle part. Also, 6" hoverboard with all flat top also will not work with our round clamp. Q. How fast and how long can the HoverSeat ride? A. The HoverSeat's overall performance fully relies on the hoverboard it’s attached to. How fast and how long the HoverSeat will ride depends on numerous factors, including road conditions, weight load, hoverboard battery capacity and motor power rating. It is recommended that all wheels be fully inflated to the maximum allowed pressure to provide the best performance. Softer wheels will reduce vibration but will also drain the battery more quickly, as core power is required to turn underinflated wheels. Q. Is it possible to damage a hoverboard with the HoverSeat XL? A. We extensively tested the HoverSeat with weights up to 230 lbs, and there was no physical damage to the hoverboard's structure or internal parts. We even towed two people with a total weight well over 300 lbs with no damage to the hoverboard. However, depending on the weight of a rider and the manner of operation, it might be possible to scratch the surface of the hoverboard in the area where the clamp attaches to the hoverboard. The clamps are covered with a soft protective layer, but it still might be possible to slightly scratch the hoverboard's painted surface. Therefore, if keeping the hoverboard looking flawless is a concern, we recommend applying optional protective skins or attaching clear scotch tape at the area where the HoverSeat clamp touches the hoverboard. Q. How do I install the T-handle? A. The T-handle is an optional item that can be installed by the customer if needed. It is provided for additional convenience if it becomes necessary to pull the HoverSeat with the hoverboard on top. You will need to use a flat screwdriver to pull out the rectangular plastic end cap from the end of the front pull tube, then slide the T-handle into the opening and secure it with the provided screw at the bottom of the pull tube. Q. Is it possible to fall from a HoverSeat? A. The short answer is YES. As with any other type of vehicle, there are always risks associated with its operation due to various reasons. The HoverSeat operates attached to the hoverboard. Therefore, its performance strongly depends on the hoverboard's characteristics and user experience. If, during forward movement, the hoverboard stops suddenly either due to its failure or the operator's failure to properly engage the pressure sensors, that might result in a fall forward and possible injuries. Some inferior hoverboard models might have faulty pressure and gyroscopic sensors that can fail during operation. Therefore, it is imperative to drive slowly when using the HoverSeat for the very first time, and take time to accustom yourself to the HoverSeat's behavior and hoverboard operations. The customer should wear protective gear, such as a helmet and knee and wrist pads during HoverSeat operation. The customer should hold on to the chair to provide additional support in case of sudden stops, which may cause them to slide forward. Please read all posted warnings and the owner's manual before operating the HoverSeat. Please inspect all HoverSeat components before each ride for loose screws or cracks in the clamp attached to the hoverboard. However, it also should be noted that even though the remote risk of injury might still exist while operating the HoverSeat, it is much less severe than the type of injuries associated with falling from a hoverboard while standing. Q. Does the HoverSeat work with all hoverboards? A. Currently, the HoverSeat clamp is designed to work only with hoverboards that have a rounded middle part, like most 6” and 10” hoverboards. Some hoverboards might not have a rounded center, and therefore, the clamp will not wrap properly around it. So-called Lamborghini 8” hoverboards do not have rounded middles and therefore are not compatible with the current design of the HoverSeat clamp. In the future, we might offer an improved clamp that can go over any type of hoverboard. Q. Why did my hoverboard start vibrating violently when I put my feet on the footpads to start riding? A. Hoverboards are designed to sense when a person is standing on top of it. There are two pressure sensors located on each footpad, closer to the wheels. All four sensors need to be pressed down before the hoverboard can start moving. If any of these four sensors are not engaged, most hoverboards will start shaking and vibrating, and may even rotate over the center. When using the HoverSeat with a hoverboard, it is important to place both feet on the footpads in such way that the weight of your feet will press on the sensors under the footpads. For most adults, the weight of their feet simply placed on top of hoverboards should be enough to engage the sensors. There is no need to press down hard. However, some hoverboards with less sensitive sensors might require more effort in pressing down in order to engage the sensors. Also, younger kids and smaller adults might not have enough weight in their feet to press down on the sensors. In cases like that, we recommend optional ankle weights that are used for exercise and sold in major retail stores in the sports section. Placed over the ankles, these weights might help to press down on the sensors. However, it must be noted that the HoverSeat might not be for everyone, and younger kids might not be able to operate it properly. For that purpose, we are developing a hands-only operation attachment. Q. How can I calibrate the hoverboard so that the footpads are turned toward the HoverSeat XL? A. Most hoverboards allow calibration that is designed to keep the footpads horizontal for standing. This feature can also be used to have the footpads turned toward the hoverboard at an angle, which makes it much easier to operate the HoverSeat. To re-calibrate your hoverboard, you will need to press the power button and hold it down for a few seconds until the LED lights blink or you hear a beep. Turn it off and back on, and now when you sit on the HoverSeat and put your feet on the hoverboard, you will feel that the footpads are operational at an angle instead of being horizontal. It is very important not to touch the footpads while re-calibrating the hoverboard, because it may cause damage to the gyroscopic sensor in some hoverboards. If that happens, the LED lights on the damaged side will stay on after turning the hoverboard on. It is easy to replace the gyroscopic sensor, and they are available on eBay and Amazon. There are plenty of YouTube videos showing how to replace hoverboard sensors. Q. What accessories are available for the HoverSeat? A. Many regular bicycle accessories can be adapted for HoverSeat use. For example, LED bicycle lights in silicone or rubber housing can be easily wrapped around the HoverSeat frame or beach chair tubing. An electric bike horn can be installed directly on a chair, and quick-release bicycle bottle holders can be attached to both the frame and the beach chair mounted on the HoverSeat. Additional accessories such as an iPad gooseneck stand can be secured to the clamp to provide GPS location or entertainment during your ride. Sun umbrellas can be mounted on top of the beach chair to provide shade during hot days. Possibilities to accessorize the HoverSeat are endless. Q. What air pressure should I put into hoverboard and HoverSeat tires? A. You can pump tires up to recommended pressure that is printed on a tire sides. When tire is hard, 10" hoverboard uses less energy to pull HoverSeat behind it. However, when hoverboard and HoverSeat tires are softer, that will provide more cushioned, comfortable ride. If you feel that 10" hoverboard is too jumpy on obstacles and provide bumpy ride, then release a little bit of pressure in its tires, and you immediately will feel the difference. Do not make tires to soft, because it will run down battery quicker and air stem can move from its position during ride. Q. Why my hoverboard shakes violently when I put my feet on it? A. There are 4 pressure sensors under 4 outer corners of footpads on top of hoverboard. All 4 pressure sensors need to be engaged to tell hoverboard that someone is standing on hoverboard before it can ride forward. Therefore each foot should lay flat against each foot pad in order to engage pressure sensors. Weight of each foot should be enough to have sensors pressed down. However, if weight of foot is not enough, then way around it is to install tubes that come with our new handles manual attachment. These tubes tightened to edges of footpads with tie downs in order to keep pressure sensors always engaged. Then hoverboard can be used with or without handles. Q. How can I improve HoverSeat XL to make it even better? A. Please see below video showing some additional modifications for hoverboard that can significantly improve HoverSeat set up with hoverboard. By replacing internal hoverboard battery with internal bicycle battery, not only you will eliminate even remote risk of a fire, but also you will make hoverboard itself much lighter, and will increase driving range over 3 times! It is also much easier to simply detach battery from HoverSeat for charging, then to carry heavy hoverboard all way to power outlet. Additional suggested mod to make experience of riding hoverboard with HoverSeat even more easier, is to cover photoelectric pressure sensors on gyroscopic boards with scotch or duct tape, so that pressure sensors are always on. If you are not going to ride hoverboard standing anymore, then there is no need for pressure sensors. Once pressure sensors are always engaged, that means there is no more need to keep pressing with foot on a surface of foot pads when riding HoverSeat. It will eliminate hoverboard vibration, risk of sudden lose of control, and will makes whole experience much better. With pressure sensors always "on", it just enough to press anywhere on hoverboard surface to propel hoverboard forward. However, it is important do angle calibration before closing sensors, because calibrating hoverboard with pressure sensors engaged can damage gyros. Q. How can I make HoverSeat to work with other hoverboards without round middle? 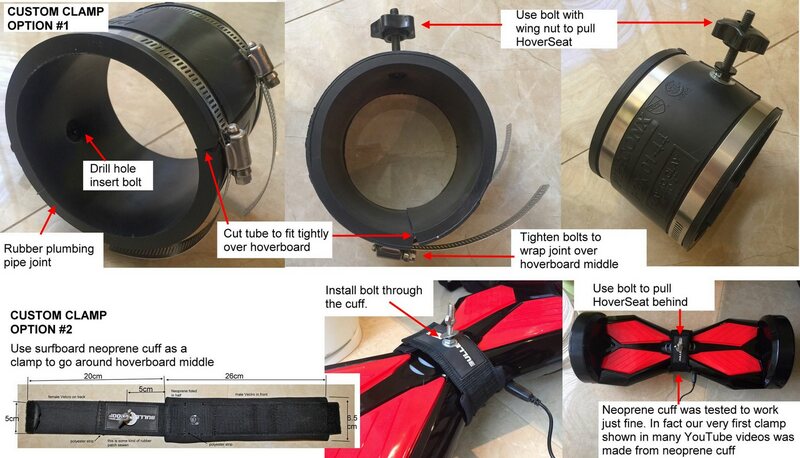 A. Clamp provided with HoverSeat designed to fit only over hoverboards with round middle.While we do not offer out-of-box solution for other types of hoverboards, such as 8" wheel for example, below are some suggested DIY clamps that might work with other type of hoverboards. Pictures provided for reference only. We do not make these clamps and do not provide additional suggestions. Q. What to do if I am unable to re-calibrate my hoverboard foot pads to operate under angle? A. Here is suggested work around using cheap yoga foam blocks that are sold in many retail stores. Just cut block diagonally, to make 2 wedges. Drill or cut 2 holes at edges, and run tie downs through holes. Make knots at ends of tie downs and use washers, so that knots will not slip out of holes in a foam. 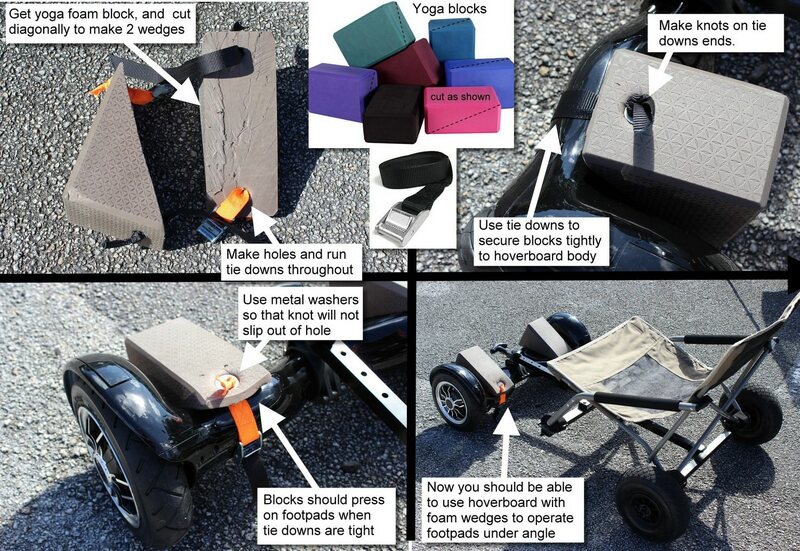 Attach wedges to foot pads of hoverboard with tie downs, such way that foot pads sensors remained engaged. This way you can easily operate hoverboard with wedges translation pressure down to foot pads. Another easy option is to use 2 pcs of Industrial Rubber Wedges sold on Amazon at $14/pc and simply secure both wedges on top of foot pads with 2 adjustable tie downs. That will allow operation of hoverboard with footpads facing HoverSeat rider.